City officials contended that the building was supposed to be a duplex, but owner John Doherty said it was an apartment decades before he bought it. 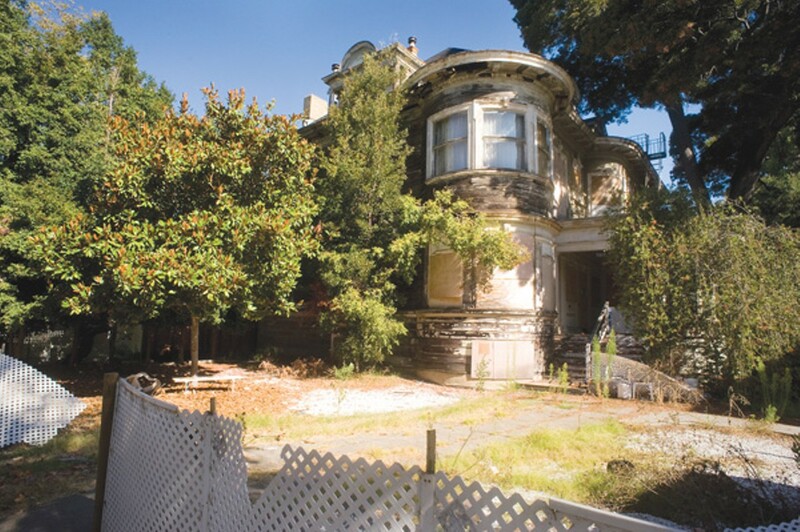 The crumbling, boarded-up apartment house on Alameda's Central Avenue was a gleaming Colonial Revival mansion when it was built more than a century ago. Today, tree branches swallow the cavernous residence, and its wooden shingles are peeling away, revealing patches of cracking, white paint. 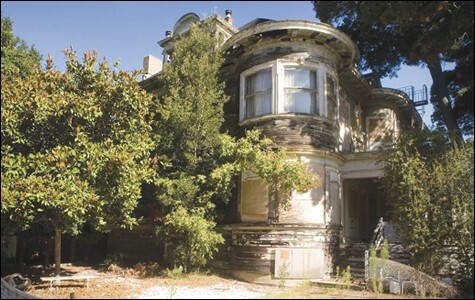 The property has fallen into disrepair in recent years because of owner John Doherty's ongoing dispute with City of Alameda building inspectors. In a complaint filed in federal district court last year, Doherty, 72, claimed that overzealous inspectors unjustly evicted him from the dilapidated Victorian, his home of three decades. According to his complaint, the inspectors contended the ten-bedroom apartment house was supposed to be a duplex and demanded that Doherty convert the 9,000-square-foot residence to two units. When he balked, and said the property was already an apartment decades before he purchased it, inspectors hastily condemned it and evicted him along with his renters, stripping Doherty of his main source of income. In an interview, Doherty, a Coast Guard Reserve veteran whose demeanor is at once gruff and amiable, said the ordeal has "consumed" his life, and he now lives in a converted warehouse in East Oakland with Social Security as his only income. "I open my eyes in the morning and think, what am I doing here?" he said. Representatives for the city say that Doherty was evicted not because of the "illegal units" but because the property had become uninhabitable and unsafe for Doherty and his elderly tenants. "The house had reached a state of deterioration" with multiple electrical, sanitation and structural violations, said Greg Fox, a San Francisco attorney and private legal counsel for the City of Alameda. Doherty, who sued the City of Alameda in 2008, is not the first to tangle with local building inspectors. Alameda, a small city with a wealth of historic architecture and little new construction activity to regulate because of its Measure A, which prohibits the building of multi-unit dwellings, is known for strict enforcement of building codes. Several lawsuits filed in recent years accuse the agency of going too far, arbitrarily enforcing complex ordinances in an effort to raise money for a bloated department with little to do. One city building inspector served time in jail for soliciting bribes from the owner of a Chinese restaurant, and another has been accused in court of similar behavior. And one prominent Alamedan who asked the city council to look into the matter later complained that his business was then subjected to overzealous city code enforcement. Observers generally agree that inspectors have become less aggressive since layoffs cut the Planning and Building Department nearly in half last year. (Saying the department was costing $1 million more than it was bringing in, officials slashed sixteen jobs and merged the agency with the city's Community Development Department.) But experts say even with fewer inspectors walking the streets, Alameda's abundance of historic Victorians combined with the city's extensive building codes can still create a tangle of problems for homeowners. According to Steve Edrington, executive director of the Rental Housing Association of Northern Alameda County, the tiny island city has more Victorians than San Francisco. It's difficult, "if not impossible," to bring many of the structures into compliance with modern building codes, he said. Laurence Padway, an Alameda attorney who has studied code enforcement in the city, said the permit and inspection process can become "a nightmare" for homeowners unfamiliar with Alameda's 50,000 pages of building codes. "It's like an extra tax that goes with living in Alameda," he said. Alameda building official Greg McFann said Alameda's building codes are "99.9 percent the same" as any other city and no more difficult for homeowners to understand. "I know that's been his argument for some time," he said of Padway, "but it's not the case." According to Padway, as of 2005 about 10 percent of Alameda homes had been cited for "code noncompliance." (He said he came up with the figure by getting records from the building department on how many homes had been cited for code violations, and then comparing those figures with public documents showing the total number of houses located in the island city.) The fines for such violations can be high. In one instance, a couple sued the city after a surprise inspection resulted in $28,000 in fees. In 2004, the city attorney dropped a criminal case against a local landlord after an Alameda Superior Court judge found the building codes the city was seeking to enforce were a violation of state law. In 2003, Padway helped homeowners Rita Mohlen and Richard Skrinde sue the city and building official McFann. The couple claimed McFann retaliated with dozens of code-violation citations after they rebuffed longtime inspector George Carder's attempts to solicit a bribe during a 2000 inspection of their waterfront home and then asked that the incident be investigated. According to their complaint, Carder suggested he could resolve their code violation problems "while rubbing his thumb and forefinger together so as to suggest a solicitation of remuneration." Carder allegedly told Mohlen and Skrinde that "if they did not cooperate with him, the city would make the plaintiffs tear down their house." When Mohlen and Skrinde refused, they said, Carder forced them to stop the remodeling work already underway. By 2002, court documents show Mohlen and Skrinde were facing 88 violations — up from the original eight Carder had found during his visit two years earlier. In their complaint, Skrinde and Mohlen accused officials of inflating the number of violations by deleting records of prior inspections they had already passed. In one instance, they said, police interrogated an electrician who insisted he had watched veteran inspector Hans Warner Williams sign off on his electrical work. Williams, who denied performing the inspection, would later serve six months in county jail for shaking down a Chinese restaurant that needed him to okay some remodel work. In an interview, electrician Eric Nielsen said police tried to intimidate him when he told them he had witnessed Williams performing the missing inspection. "It got real ugly," Nielsen said. "They were asking me if I liked working in this town and asking me if I liked George Carder, the building inspector." Fox, the city's attorney, acknowledges that the city's record-keeping system was "out-dated," making it difficult to track permit and inspection records. "Nothing was ever conclusively determined" regarding records being "destroyed or deleted or misplaced," he said. As for Nielsen, Fox said the electrician had been vague in his conversations with police and unable to remember exact details about whether his electrical work had actually been inspected. In their efforts to fend off inspectors, Skrinde and Mohlen enlisted the help of a politically influential friend in Alameda — winemaker Kent Rosenblum. Rosenblum wrote a letter to the city council on the couple's behalf in June 2003, asking officials to look into the planning department's actions. Then, just weeks later, Carder visited Rosenblum's winery and cited him for numerous code violations, Rosenblum said in court documents. In a June 2004 letter to the city planning board, Rosenblum accused city inspectors of engaging in "a questionable witchhunt" against Mohlen and Skrinde. After his initial letter defending the couple, Rosenblum said, city officials had also retaliated against him. "Building and Fire Officials descended upon our winery, and demanded upgrades and permits where there had never been a previous need," Rosenblum wrote. "They literally closed the event portion of the winery, except by special permission." Carder, who still works for the building department, did not respond to an interview request. McFann, Carder's supervisor, referred questions to the city attorney's office, which in turn directed questions back to Fox, the city's private attorney. Fox said the city attorney as well as the police department had investigated Skrinde's allegation of bribery and that the homeowner's accusation was "determined to have no foundation." "There was never any evidence to support the allegation that Mr. Carder had tried to solicit a bribe," he said. As for Rosenblum, the winery owner, "it was never determined in court that anything inappropriate had happened," Fox said. After more than $200,000 in legal fees and many sleepless nights, Mohlen and Skrinde sold their home in 2005. City officials agreed to give the new owners amnesty from the five code violations still standing by that time, Skrinde said. The couple moved to Fort Lauderdale. Ten years after the inspection that set off a legal nightmare for the couple, it's clear that Skrinde, 60, is still angry. "I was driven out of town after living there twenty years," he said, reached on his cell phone while vacationing with his wife in Seattle. "Nobody would stop these people. It was so out of control, so corrupt and so ugly." Skrinde, a technology consultant, said he and Mohlen, a real estate agent, had purchased the waterfront property with plans to retire there. "It was my dream home," he said. "I've lost years of sleep over this." In court documents, attorney Padway argued that in an effort to raise money for a then-oversized building department, city inspectors had harassed Mohlen and Skrinde with complicated, confusing codes that actually violated state law. The code enforcement program was "aggressive, illegal and arbitrarily executed," Padway wrote. Court records show an Alameda Superior Court judge on a separate case from 2004 apparently agreed with the attorney's assessment. In that case, the city attorney's office dropped criminal charges against an Alameda landlord after a Superior Court judge issued a tentative ruling saying the building codes the city was seeking to enforce were illegal. In setting up a system of complex ordinances that conflicted with state-mandated codes, the city had made it difficult for the average citizen to avoid being charged with crimes, the judge said. Fox said the city has since revised its codes to comply with state law and that none of the codes in question would have affected the Skrinde case. Beyond aggravating local homeowners, the city's inspection team has also faced scrutiny from federal authorities. In 2007, an Alameda Superior Court judge sentenced veteran inspector Williams — the same inspector accused of lying about whether he had inspected Skrinde's property — to six months in jail and five years probation for shaking down a Chinese restaurant that needed him to sign off on a kitchen remodel. "He was greedy," Chef's Wok owner Richard Chiu said of Williams. "Every time he came he wanted something else. I said enough is enough. If he just asked for free food, I wouldn't have turned him in, but I thought this guy could extort me for $100,000 or more." So Chiu began recording Williams' phone calls and took the tapes to the FBI. Then, with FBI agents listening in from the restaurant parking lot, Chiu wore a wire and a hidden video camera for several weeks as Williams suggested Chiu buy a $400 Vita-Mix blender for Williams' wife and pay for construction supplies to renovate Williams' home. Chiu said Williams also provided him with a list of items he wanted, ranging from the pricey blender to computer equipment to a vacation package for him and his wife. Chiu gave the list to the FBI. "He was stupid," Chiu said. "He put it in writing." Williams paid $2,000 in restitution, served out his sentence in Santa Rita county jail on weekends, and left the building department, court records show. The FBI confiscated the blender, Chiu said. At a 2007 sentencing hearing, the judge admonished Williams for violating public trust and taking advantage of his position as a public official, court transcripts show. Williams' attorney assured the judge that Williams, 51, was "very remorseful." In a letter that same year asking the judge for a free weekend to spend time with his daughter and "reconnect with my church family," Williams echoed that sentiment, saying he understood and accepted his sentence. He went on to quote a Bible passage about discipline ultimately resulting in "righteousness and peace." Reached by phone at his Dublin home recently, Williams seemed to take a different tone. He criticized Chiu for recording his phone calls without his knowledge and said Chiu's portrait of a greedy inspector taking advantage of a family-run business was inaccurate. "I know the facts, and that's not the way it was," he said, declining to explain further before hanging up. While Chiu's battle with a rogue inspector lasted about four months and ended well for the restaurant owner, Doherty has been sparring with the building department over his Central Avenue residence for years. Sitting at the Alameda public library on a recent evening, Doherty leafed through binders of carefully labeled documents dating back to the 1980s, peering at the pages through a pair of brown thick-rimmed glasses. "They just took my house," he said, his voice heavy with anger. "They stole it." Doherty's anger stems from a steadfast belief that city officials have carried out a deliberate plan to force him from his home. His troubles first began in the mid-1980s, court records show, when the city sued to force him to use metal piping instead of plastic for the fire sprinkler system. The city won based on the argument that the ten-unit house was an apartment complex and needed to comply with the appropriate fire safety laws. Problems flared up again two decades later, when inspectors visited the home in early 2004. Building official McFann said fire officials, who had recently performed the annual inspection required for apartment complexes, advised his department to conduct its own inspection. After the inspection, records show, officials notified Doherty that the home was actually supposed to be a duplex — not an apartment building as the city had argued in the 1980s. They also found several other violations, including unprotected electrical wiring, unsafe gas plumbing, and crumbling front stairs. In his complaint, Doherty said his electrical work had passed a previous inspection and that inspectors had overblown minor problems like a gas stove that was disconnected while a unit was being repaired. He balked at the order to convert the massive house into two units, saying it had been used as an apartment complex since World War II, decades before he bought the property. Weeks later, according to court documents, inspectors "red-tagged" the building, declaring it "unsafe to occupy." In June 2005, as Doherty was still appealing the inspectors' findings to the local housing board, police visiting the home to deliver a vehicle abatement notice saw the red-tag notice on Doherty's door indicating the property was condemned, court records show. According to a police report included in the court file, officers cut open a locked gate and entered the backyard. When Doherty appeared at the back door, the officers arrested him for trespassing. Police released Doherty more than an hour later, the report shows, when McFann told them "the unsafe status did not prevent [the house] from being occupied." Doherty received a "courtesy ride" back to his residence, the report noted. For the next three years, records show the city continued to demand Doherty eliminate eight of the house's ten units or face eviction. Doherty and his tenants filed appeals with the local housing board, submitting numerous documents showing the city had previously considered the home an apartment complex. Former Fire Lieutenant Steven McKinley and former City Attorney Carter Stroud submitted declarations on Doherty's behalf, confirming that the house had historically been zoned as an apartment house, not as a duplex, records show. Alameda Deputy City Attorney Laura Zagaroli said she was aware that previous city officials had considered Doherty's property to be an apartment complex but that those officials had relied on inaccurate information from the fire department. "His house was listed in our records as a duplex," she said. After several years of trying to navigate the city's appeal process, Doherty sued the city in Alameda Superior Court in March 2008. Two days after he filed his complaint, city officials notified Doherty that he and his tenants were being evicted, records show. A Superior Court judge denied Doherty's request to stop the eviction, saying the city could not legally enforce such an action for several months anyway. But on May 28, the city again warned Doherty that he and his tenants, many elderly and disabled, had one week to get out. By the time city officials arrived to board up the house and disconnect the utilities that day, Doherty and his renters were already gone. "We left at 1 a.m. that morning," Doherty said. "We didn't want to be there when they came." But Doherty said there was nothing he could do. Officials rejected the 1987 permit he presented for his electrical work, he said, and the building department wouldn't have issued him any new permits unless he conceded his house was supposed to be a duplex. "It was a no-win situation," he said. "All they kept saying was duplex, duplex, duplex." Standing in front of the crumbling Victorian on a recent morning, McFann said Doherty is wrong about the permits. "We could have argued about the number of units," he said, "but he would have been able to get permits to make the place safe. Our position has always been fix the building, and you can move back in," he added, surveying the jungle-like front lawn behind the partially collapsed white fence. McFann also disputes Doherty's assertion that the mansion was converted into an apartment complex during World War II. His department has a permit on file from 1951, he said, which allowed a homeowner to convert the property from a single-family home to two units. Therefore, the property must have been converted to an apartment complex sometime after that, he said. If Doherty could prove the units have been there since the 1940s, he could be eligible for an "amnesty program" that would "legalize the units," McFann added. Both Zagaroli and McFann say that even if Doherty had felt he could not get permits in time to prevent the 2008 eviction, he should have applied for permits the following year — after he was evicted. That's because in April 2009 — nearly a year after Doherty and his renters packed up and left the Central Avenue property in the middle of the night — a judge settled the duplex issue for good, siding with Doherty and saying the city could not force him to remodel his home into two units. City officials removed the duplex citation from their list of code violations. They maintained, however, that there were "illegally constructed units" within the home as well as multiple electrical, plumbing, and structural violations that justified the eviction. By that time, Doherty had been living in the East Oakland warehouse for roughly ten months and was in the midst of an all-out legal battle with the city. Even though the city no longer expects Doherty to bring the house down to two units, Zagaroli said he still needs to get permits for the "illegal construction" of apartments within the home. Regardless of whether Doherty or a previous owner built them, "the units are there illegally," she said. Told about Doherty's predicament, Edrington, the director of the landlords' association, said that if Doherty's house was converted during World War II as he argues, it would be typical of the area. Most cities would not take such a hard line regarding these type of "illegal units," he said. "Most cities would leave you alone. During the war, a lot of houses got converted into multi-family [complexes]. There was a lot of that going on." For example, Edrington estimates there are 10,000 to 20,000 "illegal units" in Oakland alone but says inspectors rarely go after such dwellings — partly because many have existed for decades and partly because they contribute to affordable housing. "Most building departments have a don't ask, don't tell policy," he said. Meanwhile, the neighbors on Central Avenue wonder about the decaying mansion. Therese Hauer, a sixty-year resident of the neighborhood who lives across the street, said the house started to fall into disrepair in the 1950s — under a previous owner — and has gotten consistently worse since. "People walk by and stop and stare at it like it's some sort of museum," she said. "It's so sad." For his part, Doherty says he can't afford to maintain the property without the rental income. 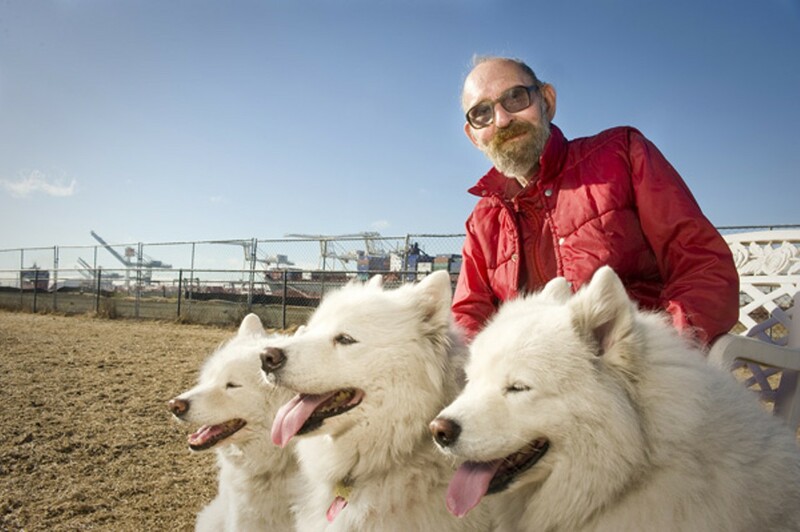 So he lives in the East Oakland warehouse with his adult niece (also evicted from the Central Avenue property) and three Samoyed dogs, surviving off the social security checks while his lawsuit slowly winds through the courts and his three-and-a-half-story home decomposes. The trial, moved to federal district court last year at the city's request, is scheduled to begin next year. Doherty recently filed for bankruptcy and is representing himself. Editor's Note: The original version of this story stated that attorney Laurence Padway determined the number of houses in Alameda using records from the assessor's office. However, Padway says he does not remember exactly where the number came from. This version has been updated to clarify his statement.